Sen. Tom Coburn (R-OK) released his annual Wastebook this past week. It contains a laundry list of doozies. The U.S. government’s gold-plating operations included $190,000 to study compost digested by worms, $297 million for the purchase of an unused mega blimp, and $1 million on a Virginia bus stop where only 15 people can huddle under a half-baked roof. These questionable (read: absurd) expenditures only represent the tip of the iceberg. Just consider the following: the Speaker of the House currently receives an annual salary of $223,500, and will receive a payment of roughly that amount, depending on the years of service, for life. An annual payment of this magnitude amounts to about five times the average annual wage in the United States. But that’s not all. For those who have had different positions in Congress, their retirements can be augmented. For example, Nancy Pelosi will not receive $223,500 for life, but roughly double that. Why? Because she is a member of Congress, currently the House of Representatives’ Minority Leader, and a retired Speaker of the House. For purposes of computing retirement pay, Congress adds and accumulates. They do not net. In addition to supporting members of Congress and civil servants, U.S. taxpayers support welfare recipients. And they support them lavishly, too. Hawaii, Massachusetts, and D.C. residents receive sizeable welfare payments (read: salaries). 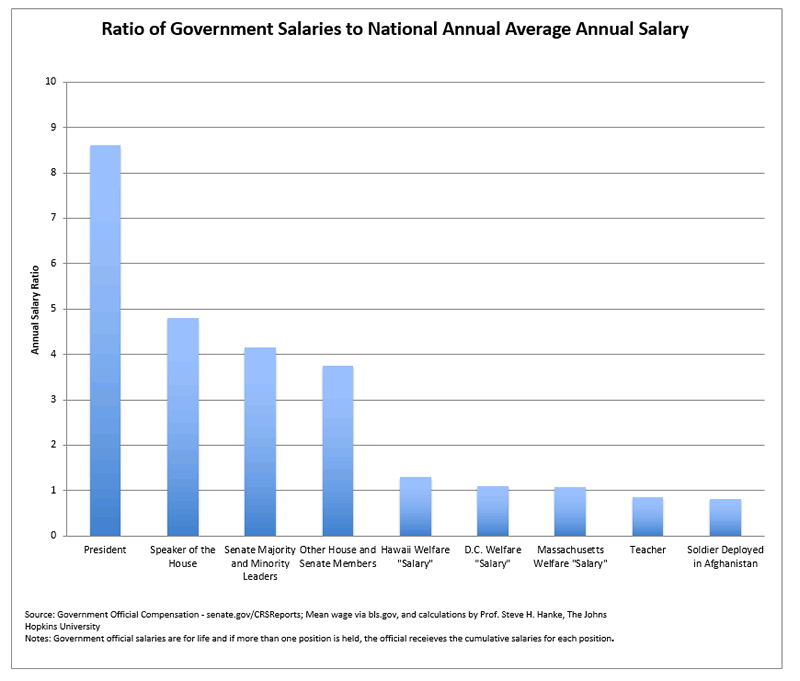 Indeed, the magnitude of these payments exceeds the average salary of an American teacher, as well as a soldier deployed in Afghanistan, by at least $10,000 per year. The public can forget all the clap-trap they are hearing about austerity. Indeed, a fairly dull knife could cut billions of dollars from the U.S. government’s largess.